Lyle Campbell’s (University of Hawai‘i at Mānoa) Institute course is set to incorporate a hands-on approach on how to “do” rather than simply discuss historical linguistics. 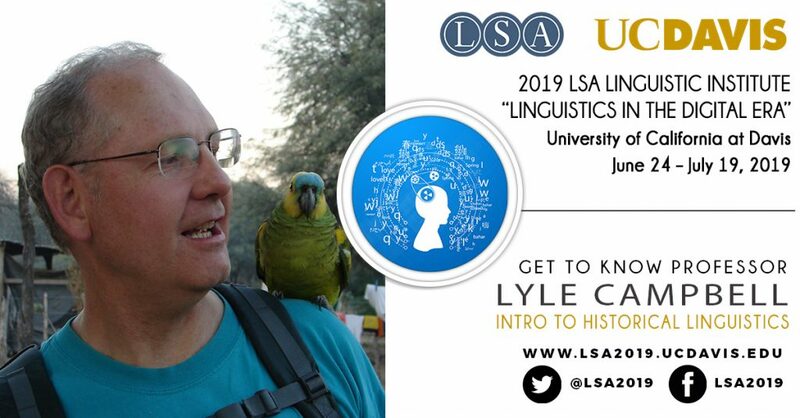 In this interview, we learn more about Lyle’s current research which includes the indigenous languages of the Americas as well as the documentation of endangered languages. MA (University of Washington) and Phd (UCLA) in Linguistics, years of fieldwork with indigenous languages of the Americas; much research in historical linguistics. Introduction to Historical Linguistics — a fun course, one needed by all linguists. A hands-on approach in how to “do” (not just talk about) historical linguistics. Endangered languages documentation (in the Chaco region of South America), history and classification of indigenous languages of the Americas, language contact in South America, reconstruction of Matacoan languages, book on unconventional tips for fieldworkers. I’d be a linguist — nothing else could compete for being satisfying. The intellectual environment and interacting with other linguists. Ice cream (definitely, a secret sin which I therefore avoid); dogs; semester as an instructor, quarter as a student. Go for it! Life is too short to do something uninteresting or unsatisfying.